What is a Pull-Tab Game Piece? Pull-Tabs are ideal as a fun way to get customers in the door! When peeled back, the top layer reveals a winning piece under one of the tabs which assures the potential customer that he or she will absolutely benefit from contacting your business. How does this fit with my direct mail campaign? Included in the package is a personalized letter to accompany your game piece. This letter can be customized to your specifications and tailored to your industry for maximum conversions. Pull-Tab Packages offer fun and prizes for your customers and help to increase profits for your business! 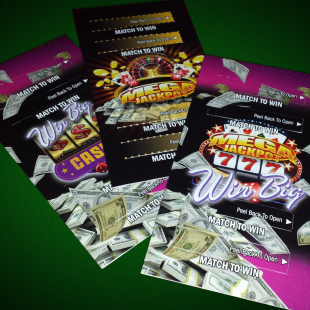 PrimeNet’s Casino Pull-Tab game piece, when included with a custom direct mail campaign, has been proven to generate unbelievable response rates. 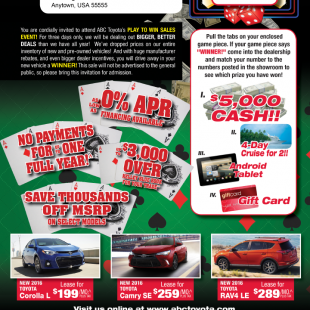 The Casino Pull-Tab Package is a unique and fun way of driving customers into your business. We would be happy to assist you in building successful campaigns using this new Casino Pull-Tab Package which works very well for the Automotive and Service industries, and really any business running limited-time promotions. Why use PrimeNet’s Casino Pull-Tab Package Game Piece? RESULTS! For every direct mail program you’ve ever done for your business, you’ve wanted results, right? Well, with this Casino Pull-Tab Package the results will not just surprise you, they will blow you away! This Package gets the attention of recipients in a way never seen before in the direct mail marketing world. Our marketing professionals will work with you to build the perfect program centered around the Casino Pull-Tab Package which will get you the results you want while still staying within your marketing budget. You have many options when it comes to your next direct mail program, so if you want something different – Something that works – Ask about PrimeNet’s Casino Pull-Tab Package! If you are interested in this direct mail package, please fill out the contact form on this page OR call us today at 800-826-2869.